When I saw the Rooibos tea, my heart sank. I am a new comer to tea: I have only been drinking tea for about a year now, and was hoping to receive a bag with some coffee products in it. In fact, I am still working my way past super fruity green teas; Rooibos is not my thing. So, in hopes of creating something edible, I asked my friend Janet (who actually loves Rooibos tea) to come over for some experimenting. Despite our best efforts, I did not finish the evening having fallen in love with Rooibos tea, but I did have a great pancake recipe! By infusing the milk with the tea, the pancakes turn a beautiful pink colour and the aroma of the tea infused milk makes a classic recipe even more delicious. 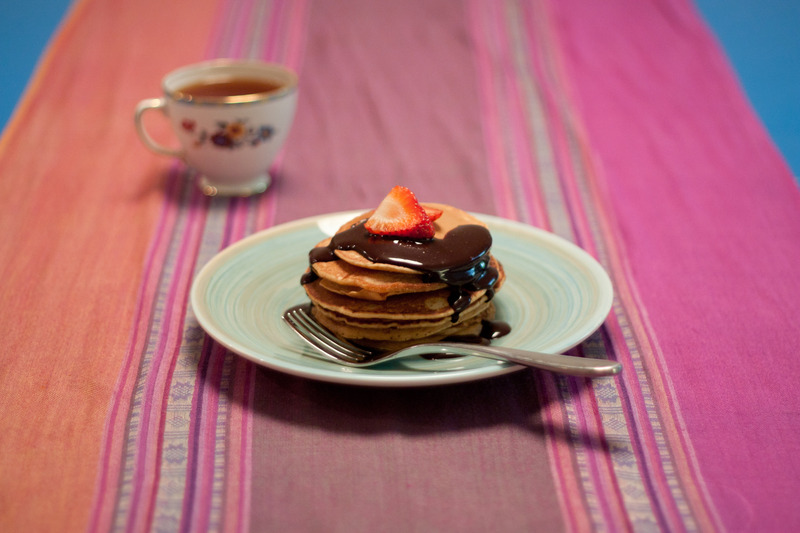 The chocolate syrup is to die for; I had to stop myself from eating it all before the pancakes were done! This recipe is so simple to make, even Adam could make them, and they are a great breakfast treat or a playful dessert. Try adding berries or bananas to this dish and it will be a winner for anyone! I have to give a big shout out to Janet for the awesome photos that she took of the pancakes. They turned out amazing and she gave me some great tips how to take photos of my delicious food, thanks Jan! 1. To infuse the milk for the pancake mix: Heat 2 cups of whole milk with 2 tbsp. of Rooibos tea in a saucepan until almost boiling. Remove from heat, cover, and set aside for at least one hour (up to four) in order for tea to fully infuse the milk. 2. To make the syrup: Break 100g of dark chocolate into small pieces and melt in a pot with 1/3 cup of water. Once chocolate is fully melted, add 1/2 cup of sugar and 1/2 tsp. vanilla. Once combined, keep syrup on low temperature to ensure it stays warm and gooey. 3. Once the milk has been infused, strain it with a fine sieve to remove loose tea. 4. For pancakes: heat skillet to medium high heat. Combine 1 cup flour, 2 tsp baking powder, 1 tbsp sugar, 1/4 tsp salt, and beaten egg into a bowl. 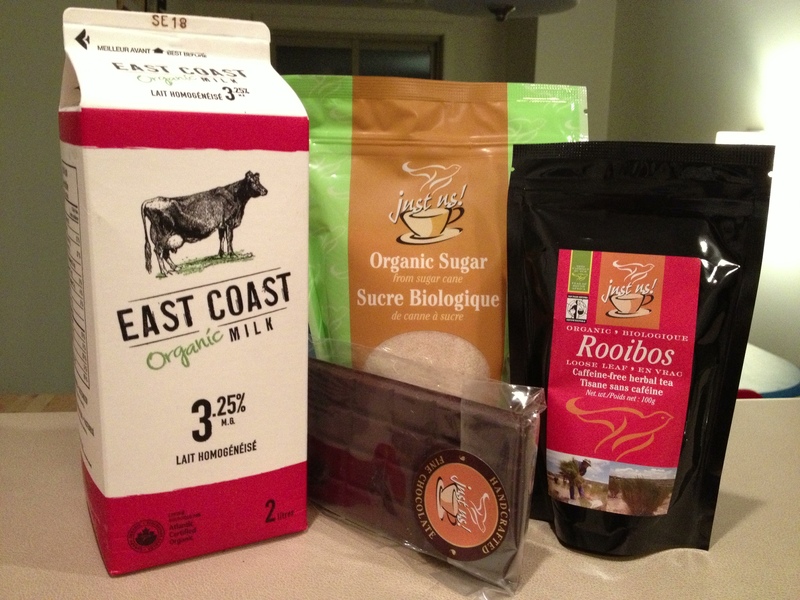 Add 1 cup of the Rooibos infused milk and mix until mixture is smooth. 5. Grease skillet with 1 tbsp of oil and make pancakes. The pancakes will be a pinky brown colour and when they cook will look almost burnt, but this is normal! 6. 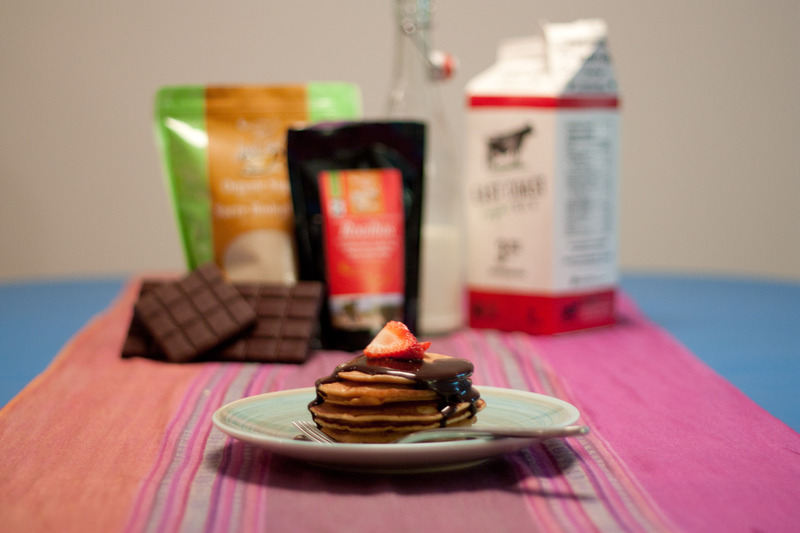 Serve warm chocolate syrup over pancakes and enjoy!